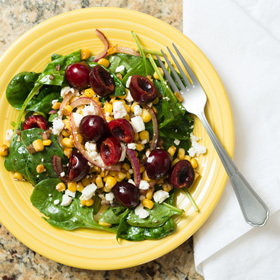 In large salad bowl, combine arugula, corn and onion. Arrange salad on individual dishes, and sprinkle with feta. Top with cherries, and serve. Serving size: 1/8 of recipe. Per serving: 215 calories, 10g total fat (3g saturated fat), 29g carbohydrates, 6g protein, 3g dietary fiber, 167mg sodium.